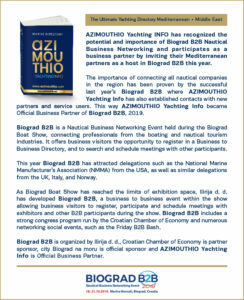 AZIMOUTHIO Yachting Info Official Business Partner of Biograd B2B! 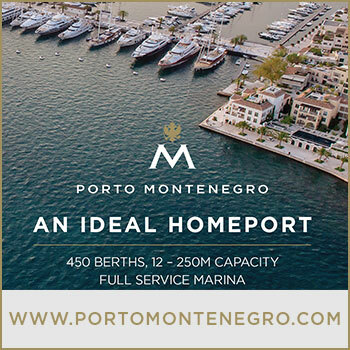 AZIMOUTHIO Yachting INFO has recognized the potential and importance of Biograd B2B Nautical Business Networking and participates as a business partner by inviting their Mediterranean partners as a host in Biograd B2B this year. 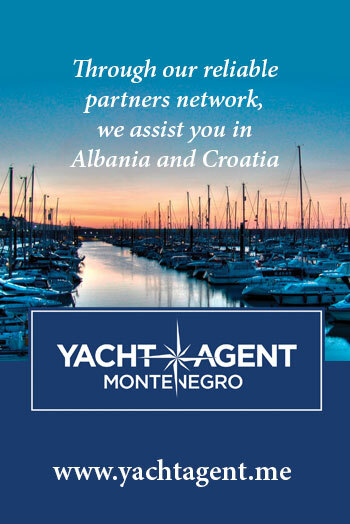 The importance of connecting all nautical companies in the region has been proven by the successful last year’s Biograd B2B where AZIMOUTHIO Yachting Info has also established contacts with new partners and service users. This way AZIMOUTHIO Yachting Info became Official Business Partner of Biograd B2B, 2019. Biograd B2B is a Nautical Business Networking Event held during the Biograd Boat Show, connecting professionals from the boating and nautical tourism industries. 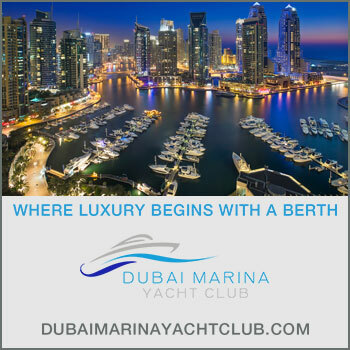 It offers business visitors the opportunity to register in a Business to Business Directory, and to search and schedule meetings with other participants. This year Biograd B2B has attracted delegations such as the National Marine Manufacturer’s Association (NMMA) from the USA, as well as similar delegations form the UK, Italy, and Norway. As Biograd Boat Show have reached the limits of exhibition space, Ilirija d.d. have developed Biograd B2B, a business to business event within the show allowing business visitors to register, participate and schedule meetings with exhibitors and other B2B participants during the show. Biograd B2B includes a strong congress program run by the Croatian Chamber of Economy and numerous networking social events, such as the Friday B2B Bash. Biograd B2B is organized by Ilirija d.d. Croatian Chamber of Economy is partner sponsor, city Biograd na moru is official sponsor and AZIMOUTHIO Yachting Info is Official Business Partner.